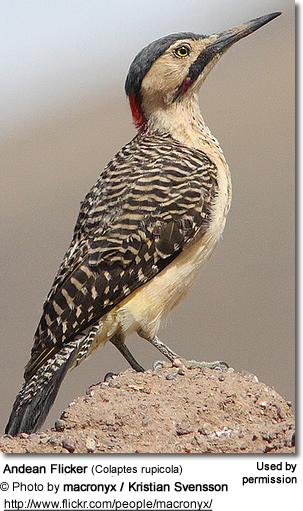 Woodpeckers tap an estimated 8,000-12,000 times per day! There are four distinct forms of pecking. These are referred to as tapping, hammering, drumming, and drilling. They differ only in intensity and speed. Tapping and hammering have multiple purposes: to locate insects within the crevices in the bark, to excavate nest cavities, to communicate to family members, and to attract and court a mate. Drumming and drilling produce the rapid-fire noise the Woodpecker makes on a reverberating surface, such as a hollow tree, metal street sign, chimney or house siding. This territorial signaling is part of reproductive behavior, similar to other birds’ songs. Both male and female engage in drumming behavior. The Adaptations to the Force of Gravity. The pounding against trees and other objects subjects these birds to enormous forces — they can easily slam their beaks against wood with a force 1,000 times that of gravity! To put that in perspective, in the 1950’s, the Air Force tested pilots to determine the maximum survivable G-force they could tolerate—it was only 46 times that of gravity. Woodpeckers may reach speeds of up to seven meters per second when they hammer into trees, causing their heads to experience a deceleration of around 1,000g (g is the acceleration caused by gravity). These birds will average 12,000 of these pecks in a single day! The Brain and Sensory Organs. Its brain is small when compared to the brain of other birds. The orientation of the brain within the skull maximizes the area of contact between the brain and the skull and results in a short duration of contact. They bore into a tree at nearly a perfect 90-degree angle. This exact, straight strike minimizes the rotational forces on its brain. Since these rotational forces sever the neuronal connections and result in concussions, the brain does not receive the impact it would otherwise. The diminished forces protect the brain. A millisecond before the bill connects with the object, the thick, heavy nictitating membranes close, protecting the eyes from flying debris. They are able to pull the narrow, constricted nares (nostrils) in tightly, thus protecting them from shards of wood or metal. Both the eyes and respiratory system are shielded from fragments by the thick bristle feathers on the cere and skin which cover the sensory organs and help to prevent the bird from inhaling wood particles. The Neck. One would assume that these birds suffer headaches from the constant hammering on trees and other surfaces; however, their bodies have adapted in that way as well. Their sturdy, dense skulls and powerful neck muscles have given them the ability to strike their targets with great force without inflicting any injuries to their brains or other bodily organs. The Tongue. The tongue is unique. Because of its extreme length, its coating of barbs, and its sticky saliva, it can extend deep into the wood to capture ants and insect larvae from the tree’s crevices and bark. When not used for this purpose, the tongue is curled around the back of the head between the skull and skin. The tongue has a method of safeguarding the brain against the shock of hammering. The base of the tongue wraps around the bird’s brain during drilling, thus contributing to the cushioning of the brain. It was previously thought that the tongue was used as a spear, but studies published in 2004 indicate that the tongue instead wraps around the prey before withdrawing it. The Bones of the Skull. In the not-too-distant past, researchers believed that the thick neck muscles were responsible for softening the blows to the head that Woodpeckers endure while tapping. They also postulated that the nictitating membrane controlled the eyelids and prevented the eyeballs from being ejected from the skull. But today’s researchers are more knowledgeable. Chinese scientists have discovered that the thick bone that cushions a brain is actually what prevents damage to the brain tissue. By comparing the Great Spotted Woodpecker’s skull structure with that of the Mongolian Skylark, a bird of similar size, they observed that there were adaptations in the most minute structure of the bones. This is what provides the skull with its incredible strength. They discovered that the brain is enmeshed in thick, platelike, spongy bone. When one views the bone through a microscope, one can see that the Woodpecker possesses a large number of trabeculae (tiny, beamlike projections of bone that form the mineral "mesh" that makes up this spongy bone plate; these are composed of various fibromuscular bands or cords which provide support to some of the organs). In the skull, these trabeculae are formed much closer together than they are in the Skylark’s skull, indicating that this microstructure acts as a type of “armor” protecting the brain. Woodpeckers are unique in that their skulls come equipped with a sort of “crash helmet.” Nature has provided its brain with a tight fit inside the skull, and the bone around the brain is thick, dense and forgiving, much like the foam inside a helmet. The spongy bones in the birds’ heads help to absorb some of the stress. The Beak. Adaptations in the beak do not increase its strength all that much, but because the beak also contains many microscopic rod structures and thinner trabeculae, the scientists theorize that the beak has adapted over time to be able to deform—actually change its shape—during pecking, thus absorbing the impact instead of transferring it toward the brain. They also discovered that the bone in the upper beak (maxilla) is shorter than that of the bottom beak (mandible); however, the tissue covering the end of the maxilla is much thicker. 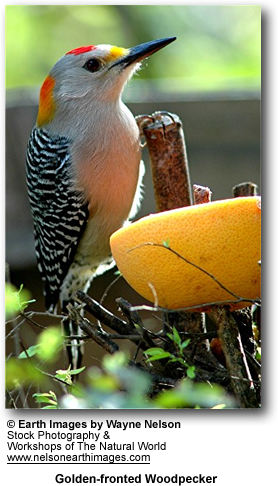 This aids in absorbing the shock experienced each time this bird hammers onto a surface. The beak is strong and comes to a sharp point. It functions as both a chisel and a crowbar to peel away the bark and probe for insects hiding behind it. The drilling and hammering serve to keep the beak sharp, pointed and very strong. Those species which use their bills in soil or for probing as opposed to hammering tend to have longer and more decurved bills. Since the beak is drilling constantly and being worn down, nature has provided it with continuous growth to replenish it. The Muscles. The muscles in the head work with the bones, contracting and expanding to absorb the shocks and distribute them around the body, thus providing even more protection.